Cold milling (also known as rotomilling or cold planing) is the controlled removal of asphalt or concrete pavement to a desired depth. Using our especially-designed equipment, we can restore a surface to a predicted grade and slope. The asphalt picked up during the milling process can conveniently be recycled for use on the same job or on future projects. Cold milling can solve road deterioration problems like ruts and unstable asphalt, poor skid resistance, bonding quality, poor pavement profile and over-asphalted streets. 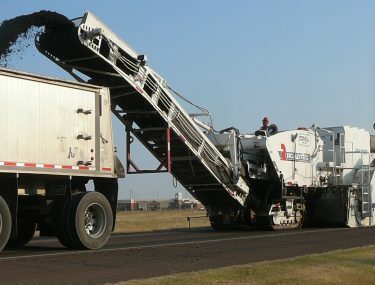 The process results in a textured surface which can be used immediately as a driving surface or can be further treated with another asphalt recycling method. This process can be used to remove maintenance material and surface flaws to prepare the surface for an overlay. It can also roughen or texture pavements to restore or improve friction to a paved surface that’s become smooth over time. Our Machines are capable of milling 1 to 15 feet wide in a single pass. Cold milling is a clean, safe, and cost effective way to correct problems efficiently and economically. Our process facilitates high productivity at a low cost, and as mentioned above, the materials removed by milling can be utilized in other road resurfacing and rebuilding projects. This aspect alone can provide dramatic savings on resurfacing projects and reduce road maintenance costs. In a time of high cost and insufficient raw materials for road repairing programs, it just makes sense to recycle all products and materials possible. Our recycling efforts are often well received and appreciated by the general public because recycling saves tax dollars and is beneficial to our environment. 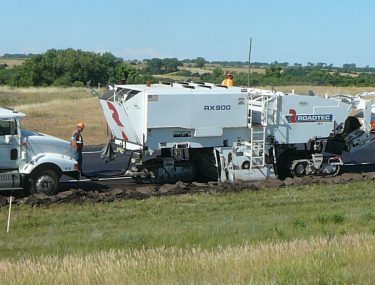 Our milling equipment is extremely versatile and allows all agencies involved with a roadway repair program to take advantage of the different machines we have.